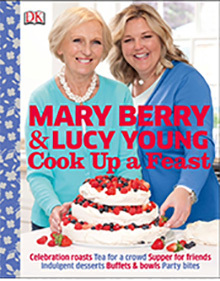 Lucy and Mary’s first joint book where they are co-authors and therefore double the expertise. Recipes for all ages and all types of entertaining – the ultimate party book. Perfect for cooking for friends, from relaxed suppers to formal parties, buffets and tea parties and food for the family. All recipes have ingredient servings for 6 and 12 people and give cooking tips for cooking for a feast tool. All recipes have conventional & AGA instructions and prepare ahead & freezing tips. The ultimate book with 150 new recipes and tips on planning your day, preparing ahead, setting the scene, using the right equipment and menu planning ideas too.